FAQ – Understanding the Pennsylvania Inheritance Tax | The Levin Law Firm - Philip Levin, Esq. Many individuals are pleased to know that they need not worry about federal estate tax, since Uncle Sam imposes this levy in the year 2015 only if their estate exceeds $5.43 million. However, the same cannot be said for the Pennsylvania Inheritance Tax. This tax applies regardless of the size of the estate, since there is not an exemption for modest estates. While there are legitimate ways to reduce Pennsylvania’s inheritance tax, to do so, one must understand some of the ground rules. In order to assist you and help your clients to better understand the Pennsylvania Inheritance Tax, The Levin Law Firm has prepared a FAQ white paper on this topic. Many factors influence the rate of tax and ultimate amount of inheritance tax that an estate will have to pay upon the death of a client before the estate administration can be completed. These include the type of property you own, the manner in which you own your property and the relationship of your intended beneficiaries. As is the case with most estate planning matters, advanced planning can save significant transfer taxes and ensure that your property distributes to your beneficiaries at the right time and in the proper manner. 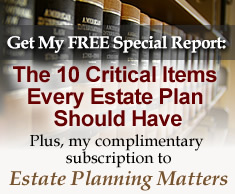 Please feel free to forward this edition of Estate Planning Matters to your friends, family members, and colleague who may need to establish or update their personal estate plan. To learn more about how The Levin Law Firm can create an estate plan designed to help your clients achieve their estate planning goals, please contact our office to schedule a Complimentary Consultation with attorney Phil Levin at (610) 977-2443.